Evangelion Unit-01 and Gamera confirmed. The latest issue of Weekly Famitsu has the first update on Bandai Namco and Granzella’s sci-fi survival action adventure game City Shrouded in Shadow in over a year, confirming the title is now PlayStation 4-only (it was previously also due out for PS Vita) and due out this fall in Japan. Visit the newly relaunched official website here. Update 6:00 a.m.: New information has come in. 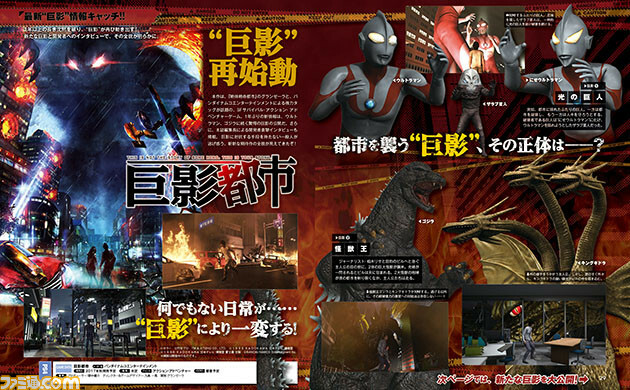 Ultraman, Nise Ultraman, Alien Zarab, Godzilla, King Ghidorah, Evangelion Unit-01, The Fourth Angel, Gamera, and Legion will appear. Additionally, a highly mobile giant shadow from a fifth work will appear alongside gunshots and sparks that cut through the darkness. Voice actors include Takuya Satou, Satomi Akesaka, Reina Ueda, Ryouta Takeuchi, and Yuuko Kaida. The protagonist and the heroine will escape together, hand-in-hand. There will be Granzella-esque choices in the game. Development went PlayStation 4-only for various reasons. Update 6:53 a.m.: View two new screenshots at the gallery. Update 7:35 a.m.: And some more details. You can choose to play as a male or female from the beginning of the game, as well as customize their name, occupation, clothes, and hairdo. You can also choose the relationship between the heroine and protagonist (“lover” or “friend”). People run away from the huge monsters you would often see in the special effects shows and anime from your childhood. We started by making a game where you can experience the feeling of being one of those people. As you would expect from a Kazuma Kujo game, there will be many choices. Depending on your choices, the heroine may come to think that you’re a terrible person. You won’t dare to see the end of the fight between Ultraman and Nise Ultraman. Because the hero is, to the bitter end, an ordinary person. Each work won’t crossover. You will experience various situations for each work on a stage-by-stage basis. Since we’re focusing on completing the main game, there are currently no plans for downloadable content. However, is it under consideration.